How and when to use Audit checklist? can be used as practice for internal auditors workshops. Allows every employee to check his/her activity performance in compliance with the new requirements of ISO 45001:2018. Conduct internal audit based on our 45001:2018 Audit checklist. Formalize the identified nonconformities, including a complete noncompliance with the requirements, in the form of a Program. Conduct recurrent audit using 45001:2018 Audit checklist. compensation for the lack of experience of novice auditors. We already have a certified OH&S management system. Are there any specific ways to utilize the Audit Checklist? Our ISO 45001:2018 Audit checklist can be used for OH&S self-assessment for compliance with the new version of ISO 45001:2018 (see 3.). Use our ISO 45001:2018 Audit checklist for internal auditors’ professional development (see 1.). Use of Audit checklist for internal audits is a good practice, proven over many years of experience (see 4.). Does ISO 45001:2018 Audit checklist cover 45001:2018 conformance and performance audits? 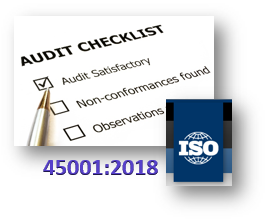 Yes, ISO 45001:2018 Audit Checklist completely covers ISO 45001:2018 conformance and performance audits. User-friendly format and professional layout - reviewed and approved by experienced ISO auditors.